10 ft. Accessible| A fully compliant ADA trailer. This trailer sits on a hydraulic drop down trailer, that brings the whole unit to ground level. A 6 ft. landing and 4 ft. ramp are added for access. This 10 ft. luxury ADA trailer is the perfect fit for your upscale event. 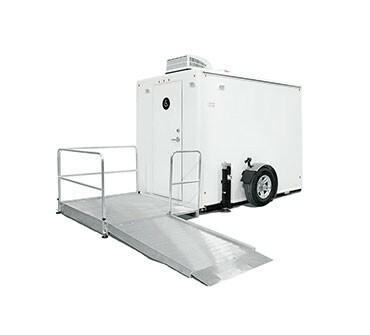 As guests enter this private, 1-Station restroom trailer they are struck by the warm, comfortable surroundings. The soft music and clean, well-lit interior provides a pleasant atmosphere where they can escape from the crowd and enjoy a few moments alone. Features include porcelain stools, urinals, and sink basins. This ADA trailer provides unexpected comfort and convenience for your guests. If no water source is available on location, the trailer comes equipped with a 63 gallon fresh water tank.